Discover the proposal for a new National anthem text in all four National languages here: Hymne.pdf. 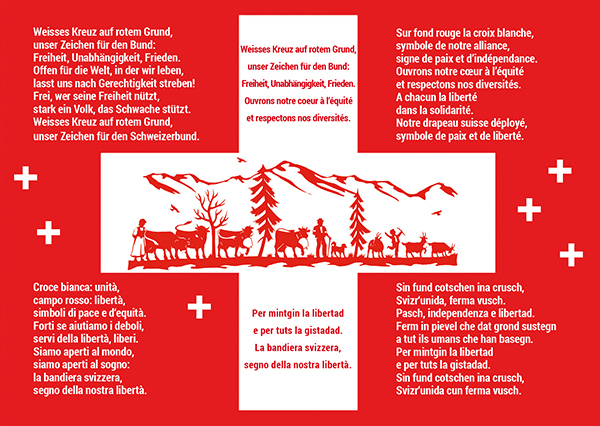 On 1 August, the communities in Switzerland and the Swiss clubs worldwide are invited to sing the proposed new hymn which is in the centre of a National debate on values. 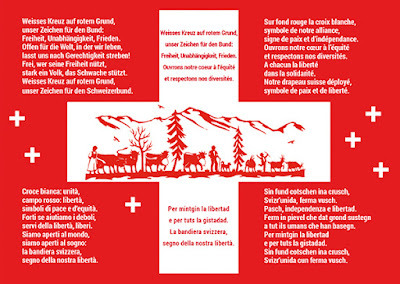 In 2013, the Swiss company for public value (SGG) launched an artists' competition to create a new Swiss National anthem. 208 contributions from all parts of the country arrived between January and June 2014. The 30-member jury with experts from music, literature, journalism, music and sports associations chose six competition entries for the online voting. In a first round of voting, the three finalists were determined. The winner was chosen in a close race in the final round on September 12, 2015. The new anthem is written by Werner Widmer and is based on the introductory text of the Federal Constitution containing values such as peace, freedom, independence and the protection of the weak. The SGG wants to initiate a national debate about the identity and the central values of our country with the creation of this new anthem text. The melody of today's National anthem by Albert Zwyssig is retained in the new hymn text. - There is no legal basis for singing the Swiss anthem in communities or at sports events? In 1981, the Federal Council declared the new anthem obligatory only for military and diplomatic occasions. - Over the past three years, the Federal Council has repeatedly defended SGG's initiative for a new hymn text in the face of parliament? - Parliament voted against cementing the „Schweizerpsalm“ (current Swiss anthem) in the Constitution?